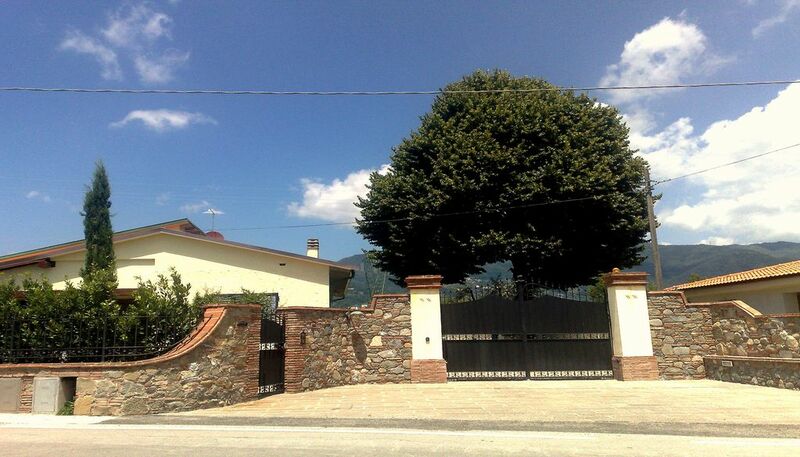 ' Villa with private pool nearby Lucca in a residential area, overlooking the hills. The estate is completely fenced and privatized; 3 bedrooms (8+2 sleeps) , 2 bathrooms (shower), hall, living room, verand, fully equipped kitchen,closet, dining room with fireplace, large garden (2000 mq. ), barbecue, gazebo, private swimming pool with whirlpool (mt. 5,50 x 8,00 H mt. 1,50), internal parking area, automatic gate, air conditioning, TV sat, Wi-Fi, pets allowed, all services nearby. We really enjoyed our stay at the Villa. The owners keep the villa spotlessly clean and tidy, popping in each morning to tend to the gardens without us even knowing. They were so helpful, providing information and assistance when needed. The pool area was excellent, plenty of sun and shade depending on your preference. There was also lots of different seating options in the garden.We used the BBQ on a few occasions and the owners provided all necessary equipment including coal and firelighters. and was very homely. Pleasing three generations can sometimes be a challenge, but everyone was more than happy here. The villa is opposite Pasticceria Del Cima which sells the most delicious breakfast pastries and cakes. There is also a large supermarket in the town and other restaurants, pizzerias and bars /cafes nearby. It is centrally placed to explore Lucca and the surrounding areas, including the beautiful Villa Reale which is only 2km away. Thank you very much for your wonderful review. Many greetings from Tuscany to you and your nice family. Ideal for our plans to visit Lucca and do some walking in the hills. Villa well equipped. Thank you very much for a good review. Many sincere greetings to you and your friends. Beautiful villa ! The view of the hills of Tuscany was amazing. 3 outdoor eating areas, nice pool, large villa that was spotless. Cristina and Annobile are very caring and attentive hosts. Great location. Great restaurants in Marlia. Our stay was absolutely perfect. Thank you very much for your gratifying review. Many warm greetings from Tuscany to you, to Walter and your friends. The villa was just perfect for us: a party of 6 adults including 2 Mums aged 77 and 89. The rooms were large, light and spacious and all were tastefully decorated whilst the furniture, light fittings, artwork and photos added to the ambience. A definite bonus was ample storage space to unpack our bags and put everything away tidily. The kitchen was well equipped with everything we needed. The garden was equally impressive with numerous places to sit and eat/read/relax/sun bathe, the fantastic pool and a large lawn suitable for games (although we never caught the Mums playing football!). About a minutes walk away from the villa is a great pasticceria and in less than 10 minutes more you can reach most of your basic shopping needs. There are also plenty of supermarkets in under a 15 minute drive. Cristina and Annibale were wonderful hosts. There to greet us and show us around when we arrived, discretely cleaning the pool and recycling early every morning and cutting the grass and tending to the garden whilst we were out. They were never intrusive but always available if needed. We would like to thank them for going the extra mile - the evenings turned unexpectedly cool during our second week and without any request from ourselves the heating system was flushed through and fired up which was greatly appreciated, especially by the Mums. We admire very much the courage of your moms who still love to travel so challenging. When we arrived we were welcomed with a bottle of red. Perfect after a long drive. The hosts were very friendly and helpful with local attractions etc. They seemed to have put a lot of work into their folder of things to do and see. The house is wonderfully decorated and well maintained. The garden and pool was where the holiday came to life with our two cockers running riot The local shops and folk were again very friendly and their English was miles better than our Italian. We would truly recommend this property and will definitely plan to stay here again in the near future. We had an amazing holiday, it was our first time in Italy and it didn't disappoint, there was a group of nine of us and the villa caterered for all our needs, the only down side was there was only 4 sun beds, the owners was very helpful and friendly, the villa is a great base for exploring Tuscany, we will definitely be back. Thank you so much for your good review. Lucca is a historic center of extraordinary charm which preserves precious testimonies of Roman, medieval and Renaissance ages. The intact wall that surrounds the town protected it from the nearby historic rivals Pisa and Florence and nowadays it's an extraordinary witness of military engineering of 1500's; it is the preferred circuit for jogging and scenic walks and bastions and embrasures hosting conferences and exibitions of all kinds. The Roman amphitheater with its extraordinary transformations of the Middle Ages is a unique jewel in the world able to bring back magical sensations. The luxurious villas in the countryside gives witness of the wealth of the ancient's silk trade. Lucca is certainly in the heart of one of the major historical and cultural areas of Tuscany, however it's a secluded area, differently than the more commercial tourist circuits. But not only art and culture: THE SEA OF 'VERSILIA', the gastronomy of the many small restaurants hidden in the green hills, the prestigious wines of ancient vineyards, the healing waters of the nearby spas, makes Lucca a compelling tourist destination of special quality.